Drought can be tough on Lycoris radiata. Obviously, these refused to miss their chance to radiate joy! I thank the raccoons for this. These Lycoris are blooming next to the kiddie pool. The raccoons have been getting drinks from it (along with the bowl of water we give them). They press on the sides for a slurp. In the process, they watered the bulbs. I know that others are healthy and will radiate in future years when water Prohibition has been revoked. I know this because last Saturday some of their fat little roots on sturdy bulbs, too tired to bloom, got unearthed. I made their acquaintance when we finally dealt with the homeowner’s nightmare: a broken sewage pipe. It had sunk several inches in our shifting clay soil and then disconnected. I entered the magic bubble of denial and refused to come out. But out I had to come. I’m ashamed of my procrastination, because moving plants in this heat isn’t a brilliant idea. Between me and my new heroes, though, we got them out fast and I raced them to potted, watered safety on the shaded patio. I wrapped the Lycoris bulbs in damp paper towels and planted them Sunday morning. The other plants get a daily misted vacation on the patio for now. I’d hoped to spare my Yucca rupicola x pallida from the shovel. Gently, my heroes pulled it out of the way with duct tape. SO, the big question I keep getting: Should we plant this fall or not? Well, I certainly am. You’ll find me at the Lady Bird Johnson Wildflower Center plant sale on Oct. 15-16. Members get in early on Oct. 14, a great reason to join now (or you can do at the door). I’ve already printed out this year’s plant list. Fall is still the best time to plant! This week on CTG, Tom meets with Sean Watson, nursery manager at the Wildflower Center, for special tips on how to plant wildflowers this fall, like bluebonnets, Drummond phlox, and this one, Indian blanket (Gaillardia pulchella). Sean includes a few drought-tough trees to establish now, like Retama (Parkinsonia aculeata). And Lace cactus (Echinocereus reichenbachii). Check out the Wildflower Center’s Drought Resource Center for tips on dealing with drought, replacing your lawn, and plant lists. One plant I’ve gotten at Wildflower Center sales is golden groundsel (Packera obovata). This week, Daphne explains how to grow this native groundcover for shade to part sun. Mine starts blooming by February, a great nectar source for insects when many plants are dormant. Combine it with annual natives, like Baby blue eyes (Nemophila menziesii) to fill in shady spots while warm-weather annuals and perennials are on break. And since fall is the time to plant spring wildflower seeds and cool-weather vegetables, Daphne answers: How does a seed work? She explains, “Seeds are tiny packets of carbohydrates, plus a tiny future plant. The first thing that all seeds need in order to germinate is water. When water and oxygen are taken up, the plant embryo can begin respiration and can digest the carbohydrate food source packaged with it and then can begin to grow.” Then, there are big seeds and small seeds. Get Daphne’s complete answer. 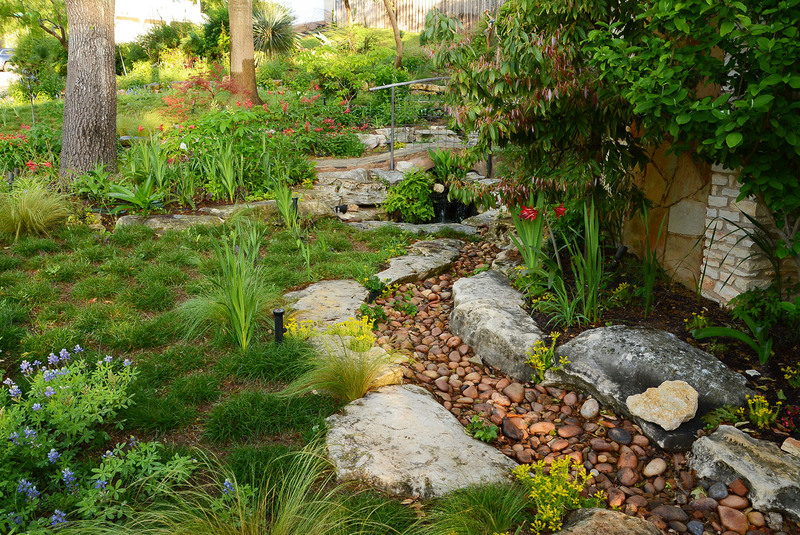 On tour, visit this low-water native plant design where Bobbie Tsukahara and Gil Starkey wanted to attract the three B’s: butterflies, birds, and bees. Working with Judy Walther and Troy Nixon from Environmental Survey Consulting, their organic, low-maintenance garden contributes to nature’s gifts, rather than depleting them. I thank Pam Penick for recommending this one that belongs to her in-laws! Early on, she guided Bobbie & Gilbert to native plants. Two years ago, their garden was featured on the Lady Bird Johnson Wildflower Center garden tour. Another dear friend, Sandy Youman, recommends this tough native, Fall obedient plant (Physostegia virginiana). Deer resist it, but butterflies and hummingbirds can’t get enough of its nectar. This member of the mint family is vigorous and will quickly cover its appointed ground to visit its neighbors. You can’t beat it if you want a low-maintenance plant in shady, sunny or part sun spots where you can let it run. It’s easily dug up to move to other spots or share with a wildlife-loving buddy. Regardless of drought, we’ve all got work to do out there. John Dromgoole demonstrates some tools that make back-breaking work in dry soil a lot easier! For more drought-tough garden design inspiration, join Stephen Orr, author of Tomorrow’s Garden: Design & Inspiration for a New Age of Sustainable Gardening, on October 11 at 6 p.m. for wine, book-signing, and a most timely presentation! He features several Austin gardens, too! This Garden Conservancy event will be held at the Arthouse at the Jones Center. General admission is $35; and $30 for members of the Garden Conservancy and the Arthouse. Order tickets online from The Garden Conservancy and find out more. Augie Doggie’s pet of the week is a young Tennessee fainting goat, Taffeta! SO, why are they called fainting goats? When startled, their legs freeze for ten seconds. Young goats fall over and look dead. Mature goats figure it out by spreading their legs or leaning against something when they feel faint. Taffeta’s so cute that I think I would faint just to see her! ← Drought & deer, oh my!